Last weekend I paid a visit to a friend of mine: Hans Kortenbach.This is the person responsible for the making of the speakers of Cees Piet. Hans is a real craftsman in wood! The cabinets by him are very skilfull made. If you take take a look ath the speakers of Cees Piet, you can see what I mean... Hans prefers the use of exotic kinds of wood, mainly because of the tonal qualities of these woods. The more difficult the design, the more challenging! Hans lives in a rebuilt farmhouse, almost in the middle of nowhere, where also his listeningroom is located; peace and quiet all over the place! In due time this is meant to be as a demonstration room for the PHY-HP products of which Hans is also the importer in the Netherlands. Normally he has a pair of speakers with the 20cm PHY units to listen to, this time he had just finished a pair new speakers which house the KM-30 by PHY. When Hans invited me to come over and listen I didn't hesitate! 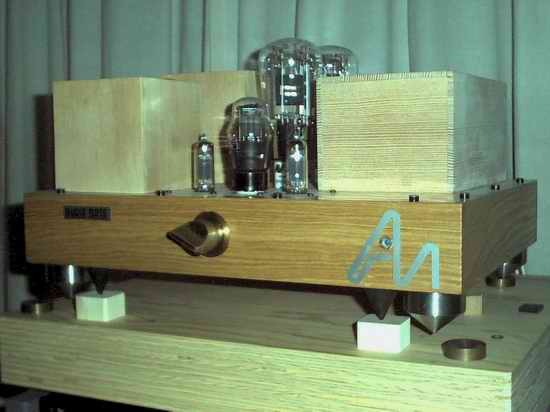 Hans' amplifier is an AudioNote Kit One, almost original. 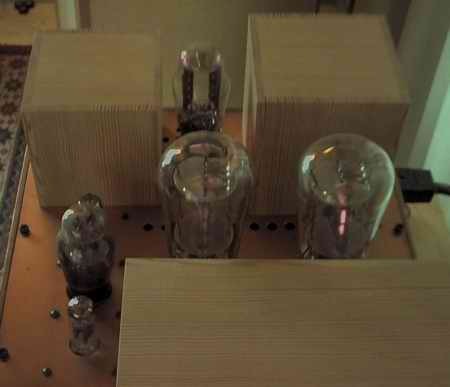 That is, the powertubes are replaced by AVVT 300B globe's and the input tupe, the 6SN7, is replaced by a Mullard ECC32. Not that difficult to realise... The output transformers have a 2K5 impedance to 4 or 8 ohms. The used units of PHY are all around 16ohms, which implies a mismatch for the output tansformers with respect to the power tube. That is, the 300B can be loaded with 5K, which is now the case, but how the transformers react to this is unknown to me. When a 300B is actually loaded with 5K you can expect being more lineair at the cost of a reduced poweroutput. Speakercables are not from PHY, they are selfmade, to a receipe of a friend. The materials used are silver, paper and and cotton. Hans can still feel his hands aching when thinking back to the making process... The mains cord is from PHY: stranded copper in cotton insulation with bakelite plug and powerpoint. Tiptoes under the amplifier are of massive ebony and do sound better than many ready available products up to hundreds of Euro's, according to Hans..
CD-player is Sony made. The wellknown "777". Nice tansport with a clamp. This player is often reviewed as "very good" by the press. The player looks very impressing and guarantees many years of listening. 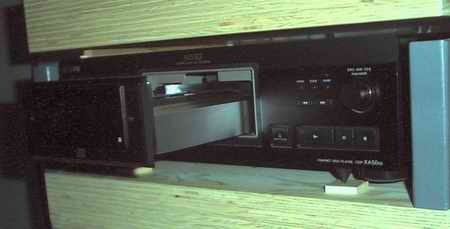 The other equipment which is in the audiorack is unknown to me. Hans has plans to build a no-compromise amplifier in the near future. 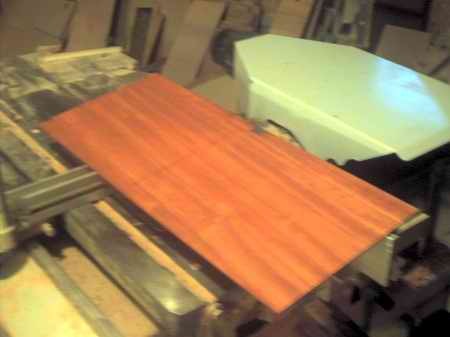 The chassis will be made of wood (ofcourse) and furthermore only the best components will be used. Hans is convinced in the use of natural materials. He thinks that if these are used they will allow you to listen to music in a way you've never experienced before. 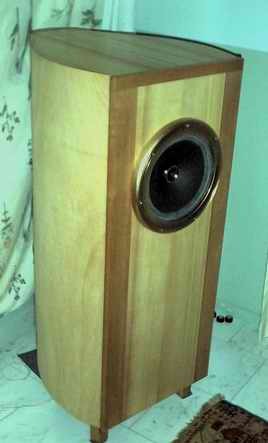 That 's also the reason why his speakers are built the way they are: Use pure wood, with tonal qualities, instead of composite materials such as MDF a.s.o. 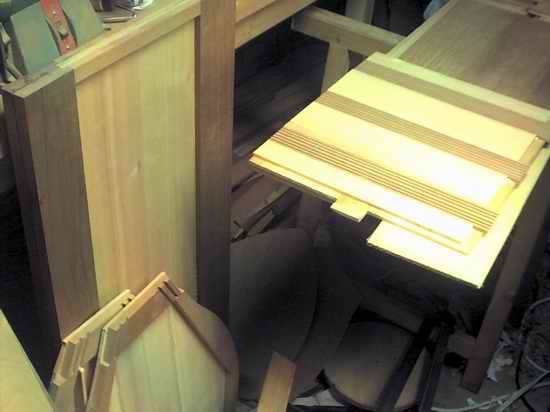 Builders of violins and guitars don't use MDF either... Not all kinds of wood are suitable for making speakers, though! A carefully selection, trial-by-error, has to be made! Yes! I've listened to the set-up as well. That was the main reason for coming along. The first that can be heared, is the enormous quality of the PHY KM-30! Lots of space and depth! A big soundstage with a almost magic sound on acoustic instruments! What is also clear, is that the KM-30 has to be played in... The unit is somewhat instable and nuances are fluctuating. Also has the listening room a minor resonance in the lower frequencies, according to Hans. This was heared as a "humm" on some tones. The room has to be tuned. Also do I think that the combination with the AudioNote transformers is far from the ideal match. There is less control in the lower end response... You can hear however what the system càn do! Very good sounding, lots of space and pace. 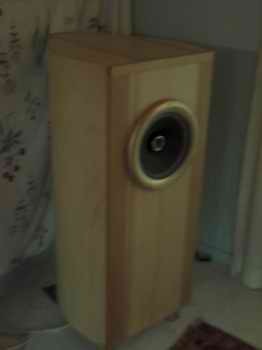 I think these speakers will excell in playing classical music and smaller jazz-combo's. Not really suitable for the rock- pop-lover. One sure thing: If you buy these speakers, you'll buy a masterpiece in craftmanship, which is not so common nowadays! Why not wait a little longer in listening to these units? 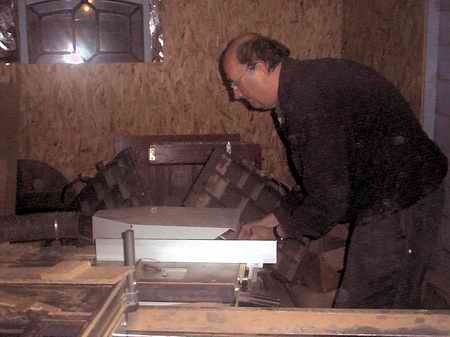 Well, Hans is (still) very busy with his day-time job and can only complete a pair of speakers once in 3 months. These just finished speakers were to be shipped only three days later to Indonesia, so that's the reason. At the end of the year Hans will stop with his current job and focuss on speaker building, so in due time his listening room will be adjusted and filled with a no-compromise amplifier and demo-speakers! You're welcome, but make an appointment first, because Hans is often "on the road"! !